This unfinished drawing is interpreted as two couples courting. The women are shown in back view and are identified by the cut-out hemlines of the skirts. The figure on the right is identified as male by his loincloth; both men have pulled their blankets over their heads. According to Barbara LaMont's research, the Plains suitor traditionally approached in this manner and enfolded his partner in his blanket. Plains Indian scholars with whom she communicated provided further details. 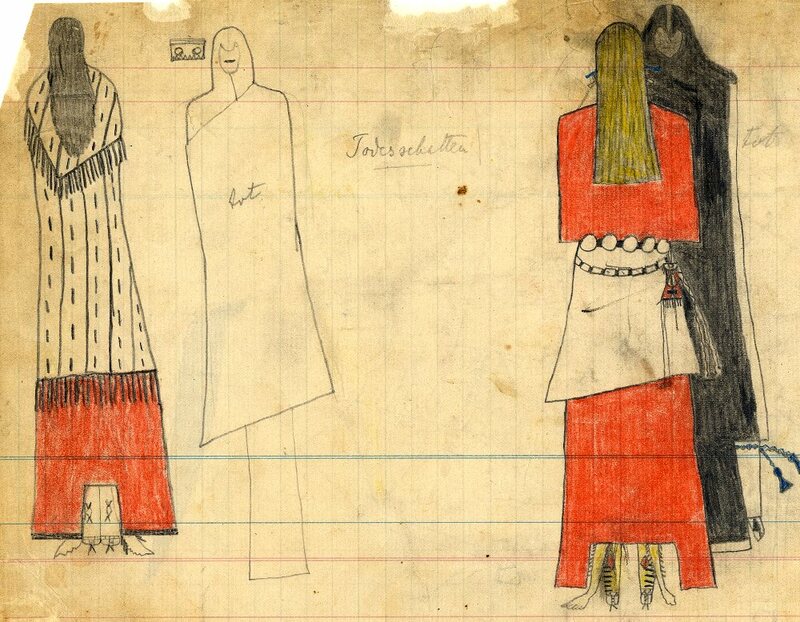 Father Peter Powell tentatively identified the drawing as Kiowa based on the cut of the dresses, the long fringe of the leggings, and the design of the pouch worn on the hip of the woman on the right. Alternatively, anthropologist Alice Marriott saw Cheyenne traits in the pouch. The blonde hair of the woman on the right is highly unusual. LaMont's research uncovered references to an Arapaho woman named "Yellow Hair" as well as two references to a Cheyenne known as "Yellow Haired Woman," or simply 'Yellow Hair." The German label on the drawing, which translates to "Death shadow," may be the ledger owner's response to the dark, rather ominous, character of the male. TARL Archives.